Cigar smoking took place on the spacious patio just off the ballroom, with panoramic views of the turquoise waters and bright sand of Miami Beach. They flew in from the cold, traveling from New York, New Jersey, Utah, Canada, London and elsewhere. They drove from Miami and other parts of Florida. 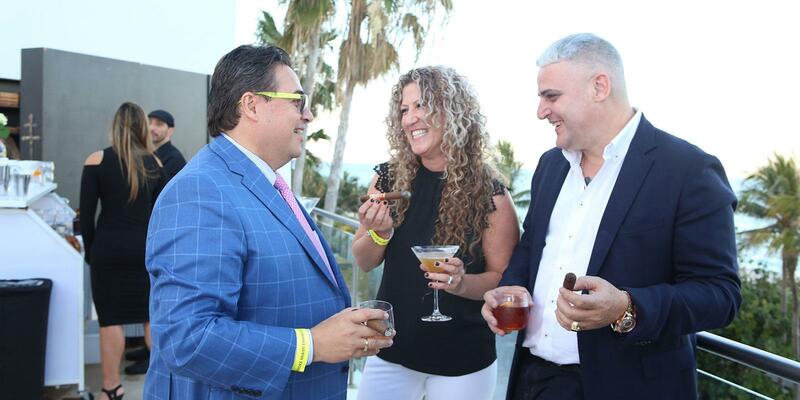 They gathered to enjoy great cigars, meet the people who make them, and celebrate in style on a gorgeous night on Miami Beach. 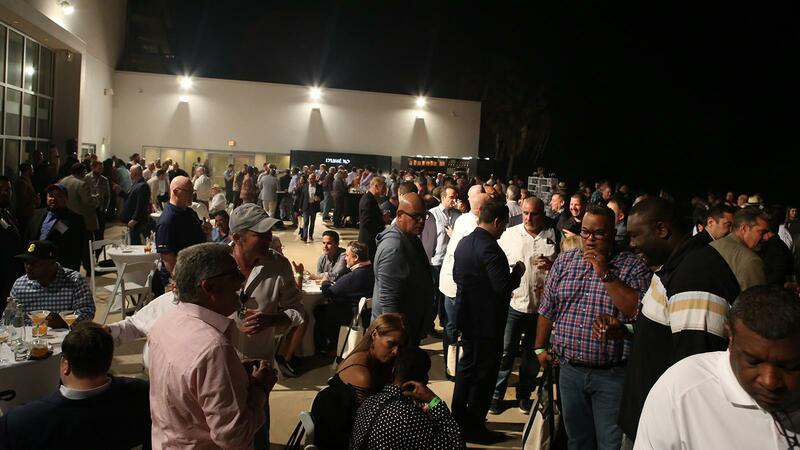 It was the second annual Big Smoke Miami, held last Friday night at the Fontainebleau Miami Beach, and the stars of the cigar world were there, handing out fine smokes to an eager audience. 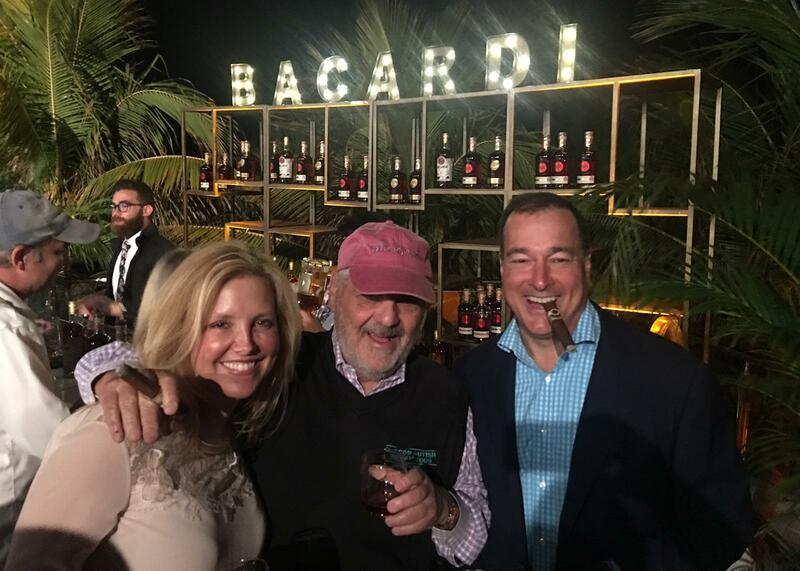 Cigar Aficionado editor and publisher Marvin R. Shanken, center, enjoys a cigar with Elizabeth and Facundo Bacardi. Jorge Padrón and his wife, Beba, puff on their cigars out on the patio. In one corner of the ballroom, near a Latin band playing the classic Cuban song “Guantanamera,” stood Rocky Patel and his brother Nish, handing out cigars and snapping photos with fans. Jonathan Drew of Drew Estate was at the other end, doing the same. Jorge Padrón, who runs Padrón Cigars, was there, standing a few feet from Litto Gomez of La Flor Dominicana (his familiar hat on his head and a small La Flor Dominicana clamped in his jaws) and cigar industry legend Ernesto Perez-Carrillo. Liana Fuente was at her family’s booth, dancing to the upbeat music, smiling and giving away cigars, not far from A.J. Fernandez, who greeted the upbeat and appreciative crowd. Rafael Nodal was at the Boutique Blends booth, and Alan Rubin of Alec Bradley shook hands with cigar smokers, standing across from José “Pepin” Garcia and his son Jaime of My Father Cigars. Cigarmakers Rafael Nodal, left, and A.J. Fernandez, right, chat with Leonor Abzaradel over cigars. It was not just the cigars that were in strong supply, but spirits as well. 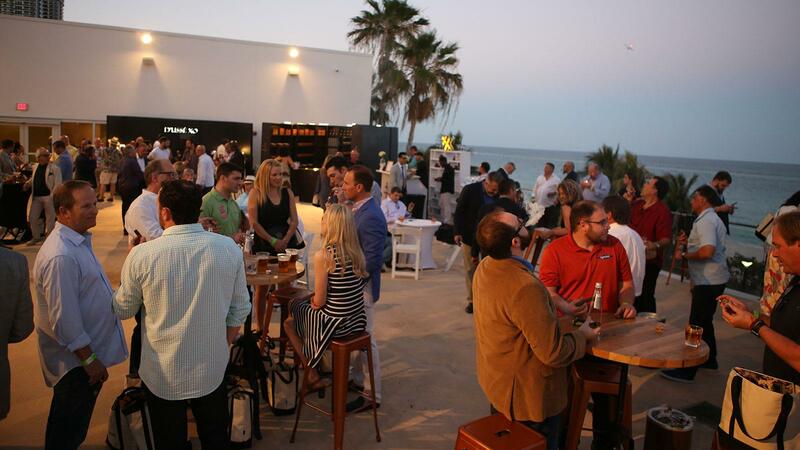 Bacardi provided a large bar inside the ballroom where the cigars were being handed out, as well as specialty drinks stations on the cigar-friendly patio. The mixologists were busy pouring Old Fashioneds, Highballs, Sidecars and other cocktails and people sipped on samples of Dewar’s (and the many single-malt Scotches used to make that blend), D’Usseé Cognac, Bacardi 8 rum and icy cold Hatuey beer. Hennessy was also pouring Cognac, and John Drew Brands was on hand with its line of spirits as well. 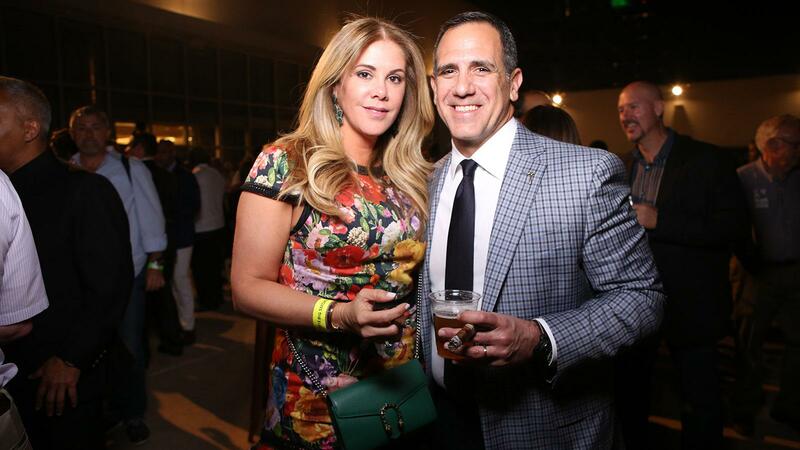 Vanessa Mota and Raymond Teixeira are all smiles with premium cigars in hand. Water was provided by San Benedetto and Boveda passed out its cigar-storage bags. Rabbit Air purifiers were on display and the Cigar Rights of America was spreading the word about fighting for the right to smoke. Cigar smoking took place on the spacious patio just off the ballroom, with panoramic views of the turquoise waters and bright sand of Miami Beach. The cigar smoking, drinking and casual conversation continued into the night. 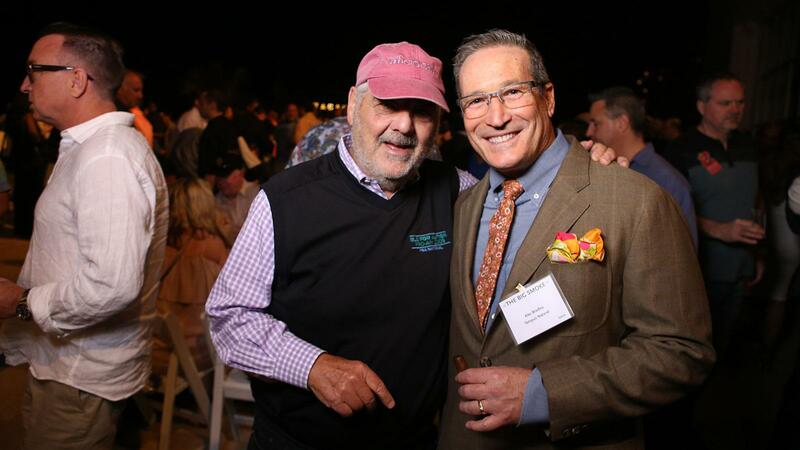 Marvin R. Shanken greets Alan Rubin of Alec Bradley. The cigar brands on hand were almost too many to list: Aging Room; A.J. Fernandez San Lotano and A.J. Fernandez Bellas Artes; Alec Bradley Prensado Lost Art and Alec Bradley Tempus; Arturo Fuente; Casa Fernandez; Cohiba; Cornelius and Anthony; Diamond Crown; Don Pepin Garcia; E.P. Carrillo; El Artista; Hamlet; Joya de Nicaragua; La Aroma de Cuba; La Aurora; La Flor Dominicana; La Palina; MBombay Gaaja; Macanudo; Micallef; Nat Cicco; Nub; Oliva; Padrón; Plasencia; Regius; Rocky Patel; Romeo y Julieta; Tatuaje; Trinidad; Undercrown; Ventura and Villiger. The cigar smoking, drinking and casual conversation continued into the night. The next Big Smoke takes place in Las Vegas, November 9 to the 11.